The Apple iPhone 5s, together with iPhone 5c, was released on September 20, 2013. It is the seventh generation of iPhone and comes with the completely redesigned iOS 7. The iPhone 5s features a 64-bit Apple A7 processor and a built-in fingerprint sensor called Touch ID on its updated home button. Since the first generation, the iPhone is always an excellent handy device for taking photos. The iPhone 5s is no exception. Wherever you go, you feel free to take out your iPhone 5s to capture the best moments. So how to preserve the unforgettable moments of life? Obviously, you can transfer the pictures from your iPhone 5s to your computer in case that your device would be broken or stolen, or there would not be enough capacity in the device. To be a little bit creative and distinctive, you can find a slideshow maker app to help you turn your iPhone photos into slide show with your favorite music and various effects. 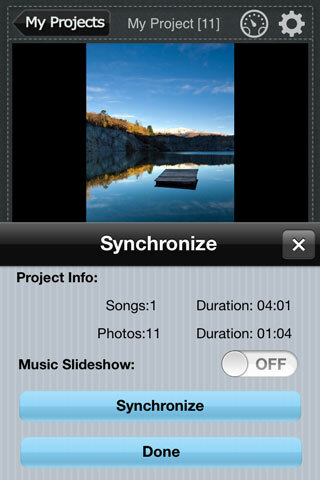 You can even encode the slideshow into a video file and save to iPhone photo library. This is what Photo Slideshow Director HD Pro is all about. 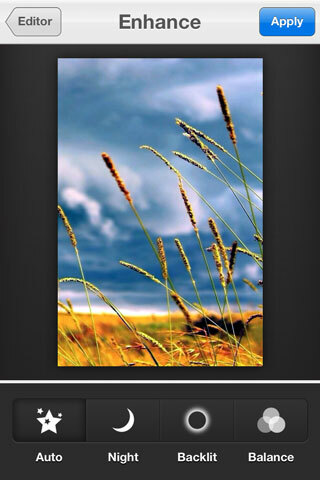 Here let me show how you can make photo slideshow on iPhone 5s using Photo Slideshow Director HD Pro. 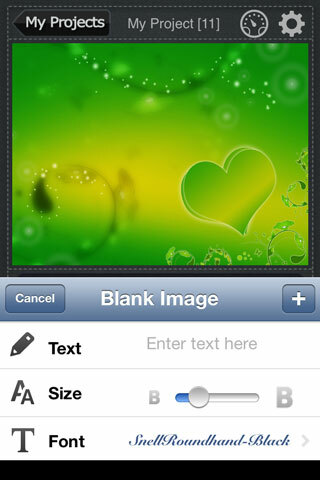 Photo Slideshow Director HD Pro is available on the iTunes App Store. It is fully compatible with the newest iOS 7 and works smoothly with iPhone 5s. 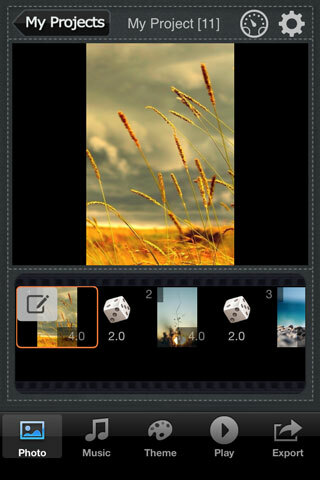 You can download and install Photo Slideshow Director HD Pro onto your iPhone 5s from the iTunes App Store. Launch Photo Slideshow Director HD. Tap "New" to create a new project. 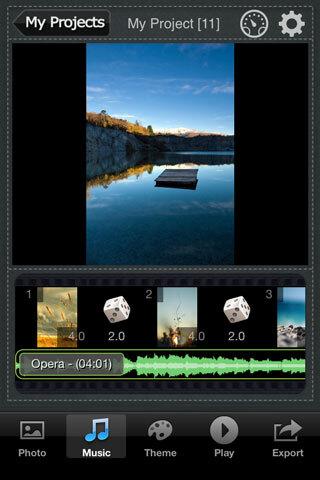 You can choose to create a new slideshow or a new music video. Then tap "Photo" to add photos to the project. You can add photos from iPhone 5s Camera Roll. Or you can import photos from web albums including Facebook album, Flickr album, Picasa Web Album, Dropbox, Microsoft SkyDrive, and Instagram. Tap "Music" to add music to the slideshow. Tap a photo in the timeline and then tap the edit icon. You will see there are 6 icons in the pop-up row. Let me explain them one by one. 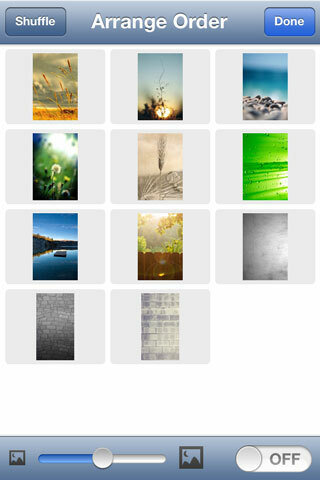 Tap "Theme" to pick a theme for the slideshow. There are 13 theme styles for you to choose from. 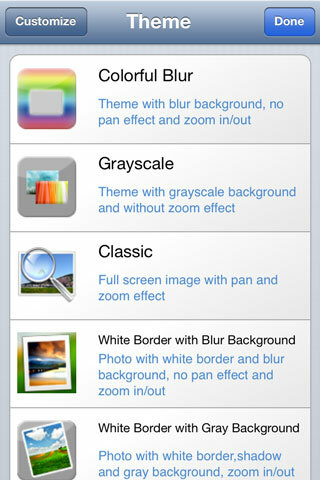 You can also customize the theme background image as well. By default, transition effects will be randomly applied to the slides in the timeline. 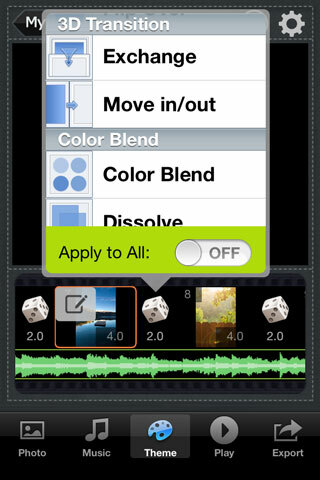 You can tap the dice icon to select your favorite transition effect from the pop-up transitions list. There are dozens of transition effects of choice. To customize photo duration and transition duration, tap the time number in the timeline. 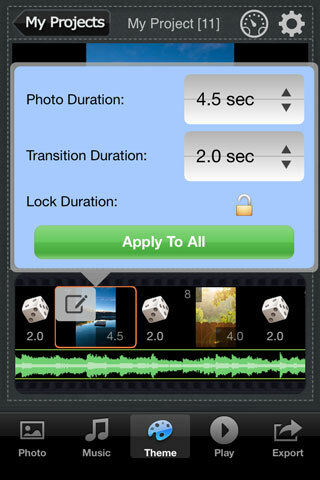 In the pop-up screen, you can specify photo duration and transition duration for the current slide. You can also tap the lock icon to lock duration for the slide. Tap "Apply To All" to apply the duration to all the slides. Tap the clock icon in the upper right corner of the main screen, and you will be able to sync the music with the slideshow. 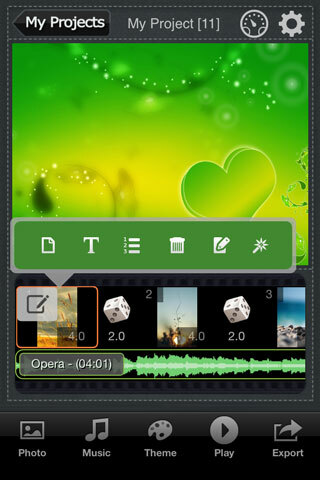 The feature is especially useful for creating a music slideshow. 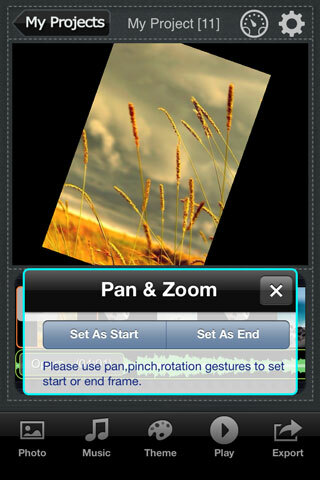 Tap the gear icon in the upper right corner of the main screen, and you can choose to loop the slideshow, portrait full screen, select output format, etc. for the slideshow. 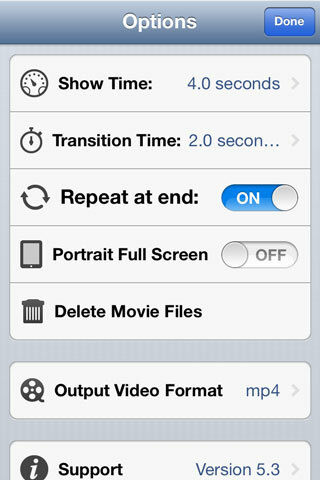 You can choose MPEG-4 (.mp4) or QuickTime Movie (.mov) as the output format for the slideshow video. Tap "Play" to preview your slideshow. If the slideshow isn't satisfying, you can go back to edit it at any time. When everything is OK, tap "Export" to output your slideshow. You can mirror your slideshow to the big screen of HDTV by connecting your iPhone 5s and HDTV with Apple Digital AV Adaptor and HDMI cable. You can also encode the slideshow to a video file and save to iPhone 5s Photo Library. Besides, you can upload the slideshow video to the cloud such as Dropbox and SkyDrive and share the slideshow video to YouTube and Facebook. 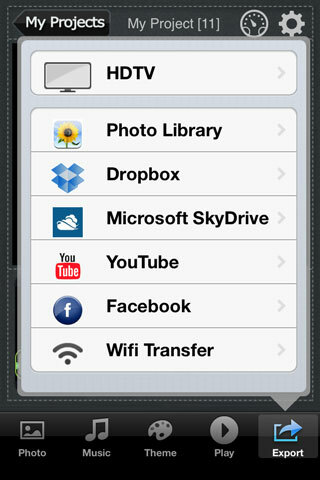 The Wifi Transfer feature also lets you wirelessly transfer the slideshow video to computer or other iPhone/iPad/iPod devices.